This Champagne is a blend of grape harvested on the Grands Crus plots of Mesnil-sur-Oger, Oger and Avize. The House’s vineyards are exclusively located in grand cru territories and from several years. The wine aged for more than three years in the winery’s cellars. The colour is a very light gold with green hues. First attack to the nose : notes of quince, grapefruit with a hint of jasmine. Secondly, a sense of biscuit/boudoirs with touches of floral aromas like acacia, combined with aromas of pear, grilled almonds, wafer batter and orange blossom. The attack to the palate is very mineral and chalky, a discreet reminder to the very calcareous soils from the Côte des blancs, with a finish on acacia honey, lightly salted. To be served around 8 to 10°C. Will perfectly fit as an aperitif but also on various entrées. 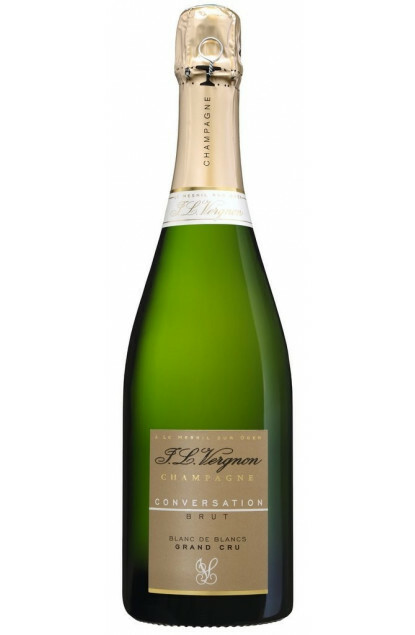 JL Vergnon Champagne, five generations and almost two centuries in the same winery, that first welcomed the Regnault Frères House, from which one of the heirs married a Vergnon. A son, Jean-Louis, was born from this marriage, and in the 1950s he recreated the vineyard on the Côte des Blancs in Mesnil-sur-Oger. He then gave to the House its current name, Champagne JL Vergnon. His son Alain took over in 1979, currently followed by Didier and Brigitte, with help from a renowned oenologist, Christophe Constant. Located in the heart of the Côte des Blancs, the Vergnon House elaborates its Champagnes exclusively from grape harvested on vineyards located in Mesnil-sur-Oger, Oger and Avize, all classified Grand Cru and exclusively planted in the Chardonnay variety.